Who are the people in Google who are working on Google Chinese Feature? They are great. Some new features (Chinese site) were introduced in Google. 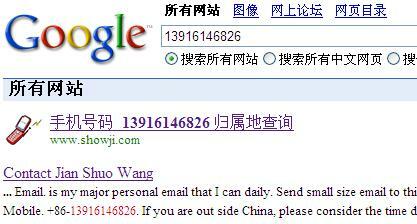 Try to search my mobile phone number 13916146826 in Google (Chinese). It will tell you that mobile comes from Shanghai and uses China Mobile network. This is not a new feature of Google. Google seems don’t want to create more features itself, since it takes time and effort AND risk. So it just direct to the right site. The sites are just lucky to get noticed by Google. Our mission is to introduce you to the fun world of Inflatables. We offer an astounding array of Inflatable merchandise. Browse our pages for Boats, Inflatable Pools for young and old, AeroBeds and Air Beds, Furniture, Inflatable Toys, Accessories for all, and much more! Offering items from Intex, and AeroBed; both world recognized leaders in Inflatables manufacturing for style, desirability, quality, durability, and value. Other items include: Inflatable Jumper, Inflatable Bouncers, Inflatable Castle, Inflatable Obstacle, Inflatable Tunnel, Inflatable Games, and much, much more! Our products are a great affordable choice and are designed for all age groups. Many of the kid’s pools will double as ball pits and are fine for indoor play during winter or stormy days. Our Inflatable Toys are a wonderful alternative to those hard bleachers at the little league games and provide an elevated vantage when watching the kids at the beach. The scuba accessories and pool floats are just the thing for little swimmers and big ones alike. Explore the pages of our site for your gift giving ideas! this feature has been provided in other sites for a long time! !